43 days ago The Society of Chief Librarians (now a charity known as Libraries Connected) posted a tweet about their assisted digital contract deal with the UK Home Office. This came as a huge surprise to almost everybody in the UK Library world, from CILIP down to Library Workers on the front-lines of public library services. I have just discovered that the Home Office is working with a number of UK Public Libraries to offer assistance with Visas and Immigration. How will this work practically (& ethically)? Will library staff be given training in helping people needing assistance? What safeguards are being put in place to safeguard sensitive information? Will people coming in for assistance be given the privacy they need to discuss their immigration and visa requirements or will they be assisted in the library itself? Will this service be limited to Libraries that still fall under the local authority or will it also be made available in volunteer-run libraries? Will Home Office staff be on hand to assist with information if required? Is the Chartered Institute of Library and Information Professionals involved in any way? If it is, how is the Home Office working with them? If it is not, why has the UK’s Library & Information Association been excluded? Were they (CILIP) offered the chance to become involved? I look forward to hearing from you in due course! I received a response tellming me that my message had been logged and that they aimed to provide a response within 20 working days. Thank you for contacting the Home Office. Your message has been logged. We aim to provide a response within 20 working days. This email message has been swept for computer viruses. This was 30 working days ago. I have been patient, knowing that in my previous correspondences with government departments that replies can sometimes be a bit late or bang on the 20 days limit. I have a question for CILIP here: a few years ago I was considering putting myself forward as a candidate for the Presidency, I had just finished my time as CKG judge and was stepping down from the YLG London Committee. I ended up not going for it as due to my workplace commitments felt that I would not be able to fulfil the role properly. I did however do my due diligence and read up on all the requirements for being President, and one of them being is that the person taking the post is not supposed to chair special interest groups or do anything that may show bias towards another organisation. Mr Khan was a trustee of SCL (and is still a trustee for Libraries Connected) and their Digital Offer lead – how was it that the President could have been involved with an organisation and not informed CILIP as to what they were planning with regard to the Home Office and the digital service contract? Is this not in contravention of one of the requirements of the presidency? Coda: If anyone from the Home Office reads this – I would still really like a response to my email, thank you! Podcasting is something that all the cool Librarians seem to be doing these days. So seeing as I am busy packing up my life to emigrate abroad (again) I thought I would use my shelving time to test out the Anchor podcasting app. Hi Candy, welcome to TeenLibrarian and thank you for giving up your time to submit to the third degree! My pleasure! Unless of course this really turns out to be a third degree (long and harsh questioning) in which case, I invoke the United Nations Convention on the Rights of the Author (if it exists). I feel the need to apologise to you – for years you have been one of my favourite people to bump into at literary events and we have known each other for years (online mostly) but this is the first time I have interviewed you on TeenLibrarian – it is long overdue! I would have nagged you incessantly over the years, except you are always in a new, nefarious disguise whenever we meet! You have two books out this year (that I am aware of) your first picture book Is It a Mermaid? out now from Otter Barry Books, and Bone Talk … coming soon from David Fickling Books. Yes! This is going to be my year of promotion … but I’m trying to write another novel while jumping up and down and begging people to pay attention to my new books. 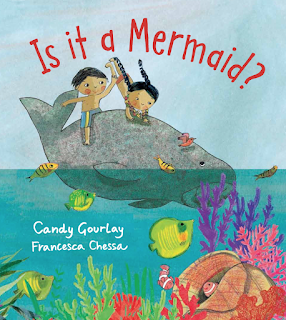 How did you come to write a picture book work with artist Francesca Chessa? I wrote the words of the picture book two years ago now. My editor, Janetta Otter Barry, then launched a search for the right illustrator. I suggested all my friends, as you do, but Janetta was looking for something in particular. A picture book is not just the work of a writer and an illustrator, there is a third vision involved that the world is usually not aware of – the editor. The editor is like a Third Eye that puts it all together. Janetta had worked with Francesca on her eco-Christmas book Elliot’s Arctic Surprise, written by Catherine Barr, in which children all over the world set sail to rescue Father Christmas. Then of course there is the Art Editor, in this case, Judith Escreet, who saw Francesca through the long months of illustrating the book. It was very strange, after working on novels, which requires long periods of solo creativity, to experience the coming together of a picture book! I was delighted and astonished by the final product! Without giving too much of the plot away can you tell me what Is It a Mermaid is about (I am guessing mermaids feature somewhere in the story)? I’ve begun speaking to Nursery, Reception and Year 1 children, and the first thing I do is hold up the book and ask them where the mermaid is on the cover. Their responses are hilarious! I wrote the story after I heard that European sailors arriving on our shores in the Far East back in the Age of Discovery, mistook dugongs (sea cows) for mermaids. How do you do that? Perhaps they’d been at sea for looooong time! I wondered what would happen if someone met a dugong that thought she really was a mermaid! What inspired you to write Bone Talk? I actually wanted to write another book, set in a World Fair in 1904 where American exhibited Filipinos in a human zoo. But it would have been a disservice to the tribal people AND to Americans not to show the context of that story. So I decided to begin at the beginning, when the United States invaded the Philippines in 1899 and annexed it as “unincorporated territory”. We became a republic in 1945 but Puerto Rico, which was annexed by the US on the same year, continues to be unincorporated territory. It’s odd how so much of the world has no idea of this. I realise that the Philippines is a small state that doesn’t do much to influence the world but the United States is a major world power. Is there much resentment against America in the Philippines because of their history? To be honest, there is a lack of awareness of our shared history. I memorised dates and events in my history classes, but nobody ever told me the context of these stories. And more importantly, ours is an unfinished story. My grandparents were part of a generation that lived under American colonial rule. They were taught to despise their own culture, to be ashamed of their race and to look up to everything American. My parents’ generation survived the second world war and their formative memories are of gratitude at the flood of American help that arrived after the war. My father used to wish that we could become another state of the United States! My own generation parroted our parents’ love for anything American, grew up watching American TV and being encouraged to speak American. To this day, the Philippines is a work in progress – nationhood doesn’t happen overnight, nor does it happen over a mere century and we’ve only properly been a nation since 1945. I know it is fiction, but how accurate are the representations of Samkad and his people? As I write in Bone Talk‘s afterword, it was difficult to hear the authentic voices of people from that forgotten era because all of the documentation was done by or curated by the United States, and tinged by the racism of that era. The observations of professionals like historians, anthropologists and state officials treated the Bontoc people as objects. It was only when I read the diary of an American housewife living in Bontoc, who documented her daily encounters with children and ordinary people, that I began to hear the Bontoc as real people. It gave me the confidence to create characters who would have been like a child of today. I visited Bontoc and asked a lot of questions about specific events in the story, especially about ritual and belief. It was difficult to be totally accurate because the Bontoc of 1899 was made of tiny communities, each with their own specific practices. I was careful not to name the community where my characters lived, so that no community in today’s Bontoc would feel slighted if there was a deviation from their practice. I based a lot of domestic detail on an anthropological description of Bontoc The Bontoc Igorot by the American anthropologists Albert Jenks. But Jenks was short on human detail and I also read many books on pre-Christian belief in the Philippines, going back to before the first Spanish explorers arrived in the Philippines in the 1500s. An American historian named William Scott Henry , realising that Filipino voices were missing from historical accounts, attempted to glean these voices from the written record. His books were a godsend. I was enthralled by Bone Talk, can you suggest sources of information I can use to find out more about the history of the Philippines? A great history (despite the focus on our relationship with the US) is In Our Image: America’s Empire in the Philippines by Stanley Karnow. America’s Boy: America and the Philippines by James Hamilton Paterson (although I disagree with some of Paterson’s conclusions about the Marcoses, he’s a gorgeous writer). You might also read the story of how Magellan “discovered” the Philippines in Over the Edge of the World: Magellan’s Terrifying Circumnavigation of the Globe by Laurence Bergreen, which his a thriller of a book! There are other brilliant books but they are written with Filipino readers in mind. I must admit that you are the only writer from the Philippines that I know (personally and as an author), are you able to suggest works by other Filipino authors that are available in the UK? When I was a child, there was virtually no publishing in the Philippines, but now, the Philippine book industry is thriving! Unfortunately it is hard to access books over here so I have to load up suitcases with books whenever I go home. The works of Filipino Americans are widely available in the UK however. Erin Entrada Kelly recently won the Newbery Medal for her middle grade book Hello, Universe. Another Filipino American, Elaine Castillo, has been getting rave reviews for her debut America is Not the Heart. It riffs on another book worth reading by Filipino author Carols Bulosan, America is in the Heart, about the dehumanising experiences of Filipino migrants at the beginning of American colonial rule in the Philippines. I’ve just begun reading Smaller and Smaller Circles by F.H. Batacan, a serial killer story. Very promising. Will you be visiting schools and libraries to promote your books? If yes, what is the best way to get hold of you to book a visit? It was my pleasure, Matt. May the best stories follow you wherever you go. The Dark Knight has uncovered one of the lost mysteries of the universe…one that could destroy the very fabric of the DC Universe! The dark corners of reality that have never been seen till now! The Dark Multiverse is revealed in all its devastating danger–a team of twisted, evil versions of Batman hellbent on destroying the DC Universe! I first read of the demon Barbatos in Batman 452, the first part of Dark Knight, Dark City trilogy – you may remember it, it had the Mike “Hellboy” Mignola cover, actually the covers for all three issues were by Mignola. I remember tracking the comics down for ages before finding them for sale at a stall on Cape Town train Station. It was these three comics that made me a Batman fan – written by Peter Milligan, they detailed the Batman hunting for his foe the Riddler through the streets of Gotham, plagued by riddles that made no sense, flashbacks to the founding fathers of the United States of America engaging in a sacrifice to raise a demon. This was the stuff of ‘70’s pulp horror novels and the satanic panic of the ‘80’s, it had teenage me hooked! 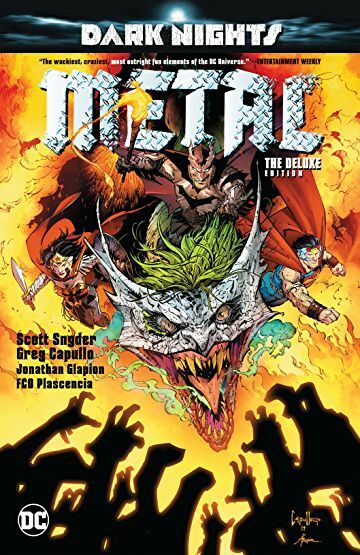 Flashforward 27 years to the release of Metal – a miniseries to end all miniseries, centring on the nightmares of the Batman, the world is slipping into darkness, twisted beings from the darkest realities stalk the night. All of them wearing the symbol of the Bat and towering above them all, its name spoken only in whispers is Barbatos! I had to, read it I mean again and again. How could the Batman triumph against his darkest selves, the story was dark and twisted, referencing the darkest aspects of the Batmythology, this is honestly I think Scott Snyder’s finest written work featuring the Bat! The artwork by Greg Capullo fits the tone of the story perfectly! I have not read a comic illustrated by him since I cancelled my Spawn subscription. His work is better than I remember it – and I remember it being phenomenal! Snyders words and Capullo’s art blend together to bring you the darkest takes on the Darkest Knight and it works perfectly! God, I was 15 again, a Batfan for the first time and I revelled in it! I have read Metal even, maybe eight times since I received a copy and tonight I am going to read it again! You should too – go on treat your shelf! On Wednesday 20th June I went to the AGM of the UK branch of IBBY (the International Board of Books for Young people). IBBY was set up in 1953, after the devastation of WWII, to promote international understanding through children’s books. The work they do is fascinating, focussing on ensuring good quality and relevant work is published for children throughout the world. There is lots of information on the UK website about local and international projects and it is well worth perusing. It only costs £30 a year to join and support their work, as well as receiving a few personal perks, so I highly recommend you do! The AGM was held at the Black Cultural Archives in Brixton, a beautiful building with an excellent mission – maintaining and growing the only UK archives of the diverse black history – and finished with a presentation from S.I. Martin about engaging young people using archive material, and demonstrating that writing can be an act of revolution. He showed us a spectrum of black backgrounds in the UK as far back as the 15C. Not only as slaves but also as princes and property owners, educated and not, having a voice and using it. His words reminded me of Geraldine McCaughrean’s impassioned plea at the CKG ceremony that vocabulary and language in writing for children in young people must be rich and wide. Steve said “we’re losing the ability to describe ourselves”, less able to incorporate histories and so embrace differences. It was definitely food for thought. Meet Leonard – a lion like no other. Leonard doesn’t like to raw and chomp. Leonard likes to read and daydream on his thinking hill. Leonard’s best friend is Marianne, a duck. But lions chomp ducks, don’t they? But Leonard doesn’t want to chomp Marianne! Leonard and Marianne work together to write a special poem to show the other fierce lions that just because lions are supposed to be fierce, it doesn’t mean they have to be. How to be a Lion is beautiful – this should come as no surprise as Ed Vere is always a phenomenal artist, but his words can stand on their own and they form a beautiful meditation on the power of being different, ignoring the herd (in this case the pride) and being true to your beliefs, yourself and your friends; and in knowing that tough decisions do not have to be faced alone. As the cool, young kids of today say this book gave me all the feels! It is usually extremely hard to find a picture book of the year but for me, I think, it may be How to be a Lion! How to be a Lion is written and illustrated by Ed Vere, published by Puffin Books and will be available in all good bookshops on the 28th June. In case you somehow managed to miss the news yesterday, the CILIP CKG awards ceremony was held at the British Library. It was a fantastic event that is well worth watching again for the eloquent speeches. I’m just going to share a link to clips of some of the event, and Jake Hope’s post about the awards and the winners. Head to twitter and look over the #CKG18 hashtag to catch up on opinions and photos. It marked the end of my two year judging tenure. It has been such a joy to be involved in the process, although really hard to not join in public conversations about the books! I now have a huge TBR pile to catch up on, ready to pick my nominations for 2019…and TALK ABOUT! Whatever Happened to the CILIP Carnegie & Kate Greenaway Medals? When the last Libraries closed and the final Librarians and Library workers packed off the retraining facilities or retired it was realised that the minute savings made from destroying the public library service made no impact on reducing the deficit or ending austerity. CILIP quietly disbanded the YLG and felt guilty about it, without Children’s & Young Peoples Librarians there were no facilitators, no organisers, no judges so the awards just did not happen. There was shock and disbelief that awards with such a prestigious and high profile history could end but what could one do? The librarians were just not there anymore – who knew this could happen? Oh sure there were a few protests and people shouting about how important they were but apart from a few column inches here and blog posts there they just faded into history. Without authors and illustrators there would be no need for the Awards, but without Librarians there would be no Awards. That may be the future but it is not this day! Today the CKG Medal winners are announced, the 81st CILIP Carnegie Medal will be awarded to the most outstanding book for children and young people and the 61st Kate Greenaway Medal will be awarded to the most outstanding illustrated work. It is amazing, for years I have been fascinated by the Medals and then I was selected to join the Judging Panel and became one of a select few to see behind the curtain and now I am more engaged with the awards than ever before! Knowing how much work, dedication and personal sacrifice goes in to running and judging the awards is mind-boggling. Seriously if you want to know more about how the awards function then get hold of a judge and speak to them! You will learn that Librarians are Super Heores! The fact that the awards are run wholly and solely by librarians is often overlooked, and in the current era of cuts and closures this makes them vulnerable. The threat is very real, and the loss of prestigious awards such as the Carnegie and Kate Greenaway Medals is something that could be used by Library Activists protesting the ongoing loss and deprofessionalisation of Libraries in the UK. That, however is a consideration for Tuesday morning, for today is a day for celebrating literature, reading, authors and librarians! If you excited about the 81st CILIP Carnegie Medal and the 61st CILIP Kate Greenaway Medal recipients then you can watch live here: http://carnegiegreenawauk/sty.org.ream.php from 12pm and join the celebrations on social media using the #CKG18 hashtag.